Hey there Friends! If you follow along on IG you know that on Monday I celebrated my 36th birthday. 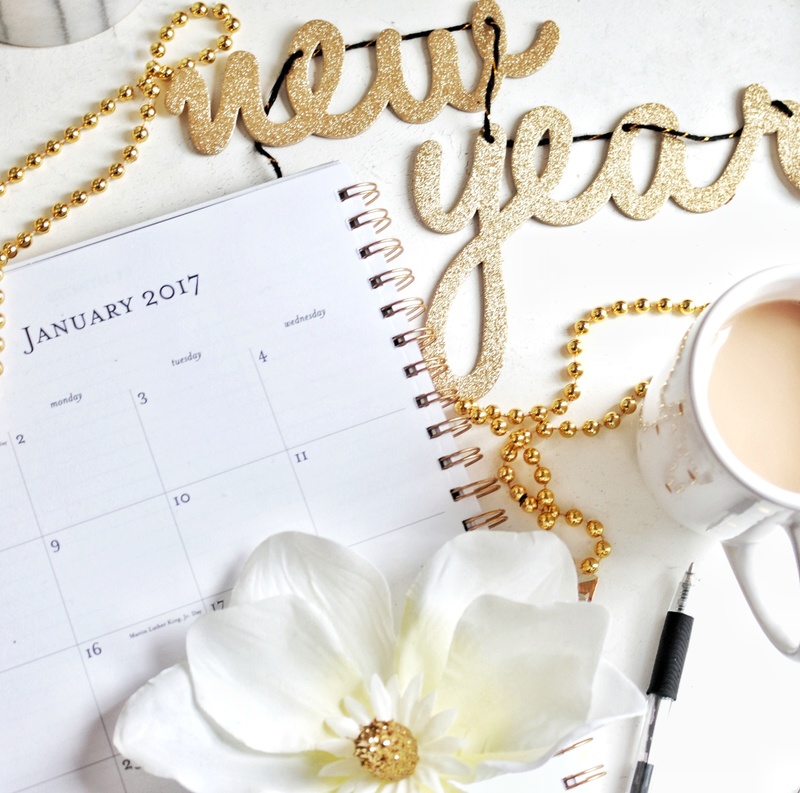 As I sat enjoying breakfast in bed wearing a dazzly tiara, I set my goals for 2017 in stone. This year I have decided to focus on being more intentional with my goals and actions rather than just "winging it" as I usually do. This post may contain affiliate links for your convenience. Should you click on them and make a purchase, I will receive a small commission at no cost to you. This year we hope to continue to work in the basement. 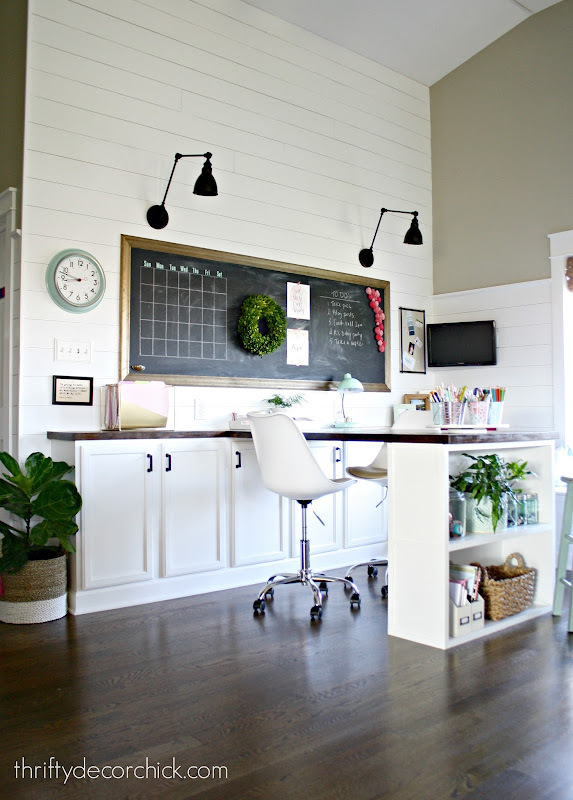 My hope is to create a homework/craft area inspired by Sarah's Craft Room. I would love to have a place where the kids can study and I can work on small craft projects and even work on my blog. We will kick start this project very soon. Although the windows in our basement are rather small, we live fairly close to our neighbors, so we are definitely in need of privacy. l will soon be exploring options for custom window coverings to further update this space. In our finished basement we have 4 doors that are visible from our family room space. These doors definitely need to be painted and updated with hardware. 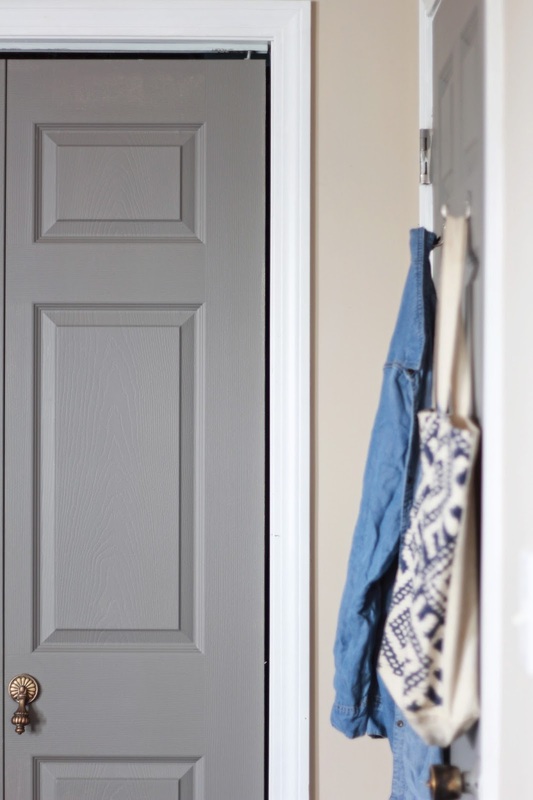 I've yet to decide if I will paint the doors gray as I did in our master bedroom or black, so I have some Pinterest inspo searching to do. After spending the past couple of weeks in our new cozy basement family room, we've realized how amazing it would be to have a small kitchenette downstairs to allow for easy access to beverages and small snacks while we veg out. I am just in love with this little bar area from At Home with the Barkers and think that it would be a fun addition/DIY to tackle in the coming months. Many, many years ago, we added bead board wallpaper back splash to our kitchen which has lasted wonderfully, however, I've always wanted tile back splash but could never nail down a tile I loved ( or would love for a long time). 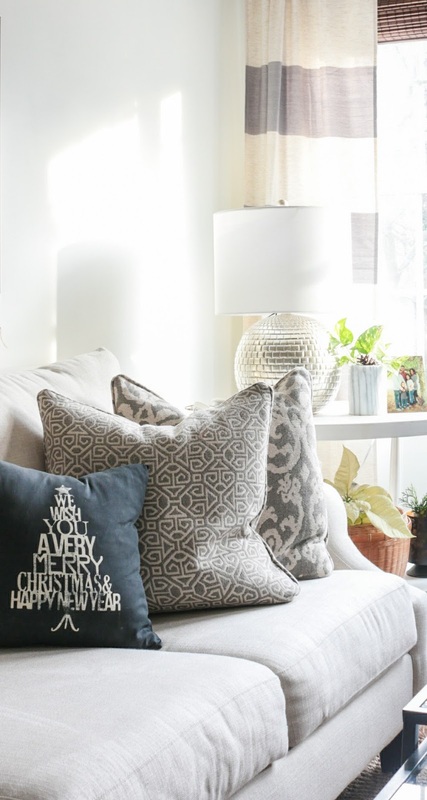 When I came across Ashley's kitchen makeover, I fell in love with (everything of course! but especially) her back splash. Although this may not happen soon . . . it is definitely on the radar. The living room took about three months to get fully painted, but my hope is to continue the paint color (Behr Paint Night blooming Jasmine) into our kitchen to really brighten up the area. and last but definitely not least on my long list, of plans . 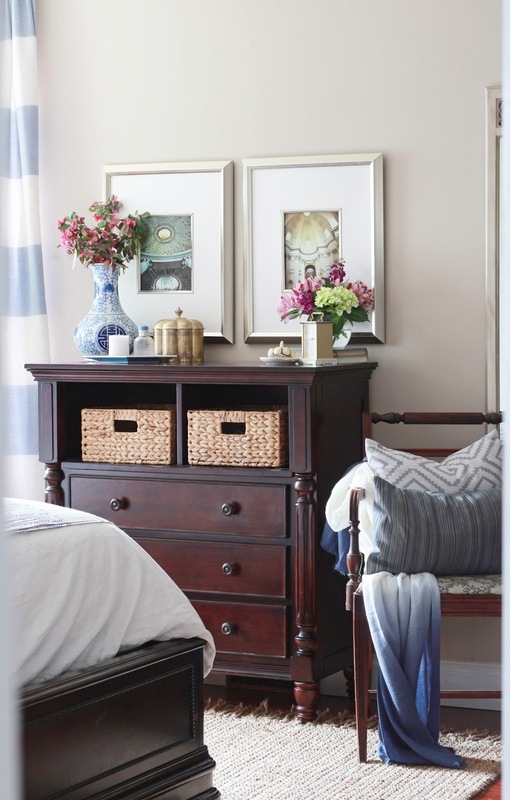 . .
You may remember from my master bedroom refresh back in May, how I discussed how I wanted new furniture because our bedroom furniture doesn't really suit our needs as far as storage space goes. Well 8 months later, we are still living out of laundry baskets (Gasp!) most of the time, and I've seriously had enough. So new bedroom furniture for us, is definitely on the horizon. So those are a few of the major projects that I hope to work on this year. I'm also working to plan better and blog more often. Sometimes as a blogger, I forget that there are so many of us out there at different skill levels, and tend not to show the things that, to me, seem trivial. So I will be sure to document my processes more going forward and hopefully it will be helpful for you all. Carli, I can't wait to see these updates! I'm really excited about your basement progress and Sarah's craft room is STUNNING! And yes, I'm one of those readers who wants to know all the nitty gritty "trivial" stuff - sometimes all it takes is a photo from a different angle and I go "ohh! that's how you do it!" I know everything will be fab!! Happy goal reaching!! Those give some good ideas. I think I'll share my upcoming projects too!! Yay Ashley! I'll have to stop by, love your projects! I love your updates. Can't wait to see it all come together! I absolutely love the basement!! Thanks Erin, I look forward to continuing the updates down there and really getting the nost out of the basement. Carli I am so excited to hear about your basement plans, that is on my agenda for the year ahead too and I'm looking forward to seeing what you do! Thanks Lisa!!! So many things to be done! Can't wait to get started. Carli, I can't wait to see all your plans come to fruition! I'm excited to see more of your basement cause I love what you have done so far.